It began just a little over a year ago. I was hand chosen as one of twelve Elite Entrepreneurs around the world to work with the renowned power duo actress Stephanie Hartman and producer Gail Kingsbury. YouTube, HULU.com and Google are developing channels to allow the right people to start their own shows. Stefanie and Gail wanted to put yours truly smack in the middle of this massive trend with their new channel they call Real Wisdom TV. Can you imagine being featured on TV websites that already have 100’s of millions of viewers, a vast majority of whom love animals? What a difference I could make for animals everywhere. We filmed our TV Episodes at the Pirates Cove Mansion in Las Vegas, Nevada last Fall. If you’ve trained or worked with me personally, then you know that my work is spiritual in nature. I’m all about healing, growing and evolving into being the BEST we can be – for us personally as well as our animal. My vision is that I’m here to do more than just teach people to talk animals. 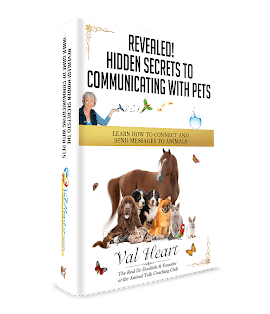 The work of animal communication is important… and it’s more than just giving animals a voice. I see it as a huge part of the healing changes taking place on the planet. Tele-communication, spirituality and energy awareness is now coming into mass consciousness in a BIG way. It’s time. So on behalf of each and every animal lover on the planet who shares my vision of a world where animals are respected, listened to, and known as the healers, teachers and Guides they truly are… I’m stepping forward in faith because the Universe has chosen me as a spokesperson on behalf of the animals. Stefanie and Gail’s production team has fallen behind schedule so they have not released my episode yet, but I have permission to give you a sneak peak. Here’s what some of our viewers have shared! I can’t wait to hear your feedback. Please let me know in the comments.